This sleek wallet from Authx combines modern aesthetic with the comforts of an old-fashioned wallet. 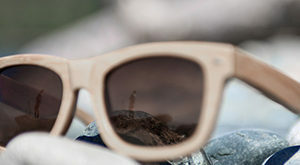 It’s crafted using high-quality materials and designed to fit into any pocket. Focused on minimalism, the wallet has only enough room for the essentials. It’s made to eliminate bulk on your everyday commute while keeping important cards and cash within reach at all times. But how does it hold up to other minimalist wallets? The Authx wallet is made from genuine cowhide leather. Available in either black or brown, the leather is durable and quite impressive. It has a very unique and subtle texture that can help improve grip without affecting the accessory’s ability to slide in and out of your pocket. This texture is achieved with a layer of polyurethane that’s embossed with a canvas texture. There’s also the brand’s label embossed on the front. The edges of the leather are very smooth and strong. They’re precision oiled and feature reinforced stitching, making the unit feel very solid overall. The first thing you’ll notice about this wallet is its small size. It only measures 2 1/2 inches wide by 3 1/2 inches tall. These are very similar dimensions to the average credit card. 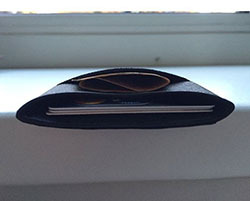 When empty, the wallet is only a mere quarter of an inch in thickness. Because it’s so thin, it can easily fit into the front pocket or be tossed into a bag. At less than half the size of a standard bi-fold wallet, there’s no need to worry about a bulging pocket. Despite its small size, the wallet can hold a lot. At max capacity, it can hold 9 cards plus some paper cash. While the wallet is designed for to carry as few cards as possible, they can be packed quite tight. Even when it’s full, the leather material stays together at the seams to keep your cards protected. The wallet weighs in at only 0.8 ounces. Of course, this will fluctuate based on what cards you’re carrying. However, it’s very light despite its solid build. Because it’s so lightweight, it’s comfortable to keep in any pocket. 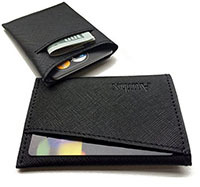 Typically, bulky bi-fold wallets have a significant weight that makes them noticeable to whoever is using it. With this wallet, that issue is virtually eliminated. The small footprint and lower weight can make it disappear in your front pocket. You won’t notice you’re carrying it just like other won’t see it. When it comes to design, there’s nothing much to write home about. There’s no flashy or unique mechanism to keep your contents safe or any pops of color. It’s very simple and sophisticated in design, and that’s what makes it a great wallet. There are three pockets in total to keep the essentials. One large main pocket is meant to house up to eight cards. The cards are held together by the pressure of the two sewn sides and simply slide in and out. It’s a vertical pocket that’s located on one side. A second pocket is located on the front. It’s a horizontal pocket that has a slightly angled cutout. It’s made to house a single card. You can use it for your most commonly-used card or for identification. Either way, it’s positioned front and center so that it can be removed in an instant. The angled cutout makes it easy to grip onto the card and slide out with one motion. Finally, a third pocket is located on the back of the wallet. It’s another vertical pocket, though it’s not big enough to accommodate a standard card. It’s made for paper cash. It can hold folded up bills and keep them neatly tucked away. 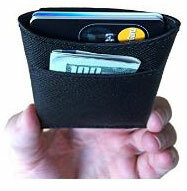 Regardless of where you put a card, the wallet is fairly simple to load or dispense. The only main issue would be with cards that are placed in the main pocket. Because it’s not a layered pocket, there’s no way to know where a specific card is. You’d have to take all eight of the cards out and rifle through the options until you find the right one. Of course, that only applies if you fill it to capacity. The main front pocket and cash pocket are both easy to use. 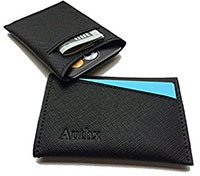 Overall, the ultra slim minimalist wallet from Authx is a great option for guys that want to cut down the bulk and go with something a bit sleeker. It’s very simple in design but uses high-quality materials that are reminiscent of traditional bi-folds. It is limited in what it can carry, but that’s the whole point of its design. It’s made to fit into the front pocket for comfort and convenience. With its low price tag, there’s no reason not to give it try.